125g (4oz) mature Cheddar cheese, grated 30g (1oz) parmesan cheese, grated 175g (6oz) pre-cooked lasagna sheets chopped fresh parsley to garnish . 2tbsp olive oil 1 kg (2lb) minced beef 45g ( 1½ oz) plain flour 300ml (½ pint) beef stock 1× 400g (14oz) can chopped tomatoes 6 celery stalks, finely sliced 2 onions, finely chopped 2 large garlic cloves, crushed 4tbsp tomato purèe 1tsp sugar Salt and black pepper . 60g (2oz) butter 45g (1½ oz) plain flour 600ml (1 pint) milk 1tsp Dijon mustard ¼tsp grated nutmeg . 1- Make the meat sauce: heat the oil in a saucepan, add the beef, and cook, stirring, until browned. 2- Sprinkle in the flour and stir for 1 minute, then add the stock, tomatoes, celery, onions, garlic, tomato purèe, and sugar. Season with salt and pepper and bring to a boil. Cover and simmer for 1 hour. 3- Meanwhile, make the white sauce: melt the butter in a saucepan, sprinkle in the flour and cook, stirring, for 1 minute. Remove from the heat and gradually blend in the milk. Bring to a boil, stirring until the mixture thickens. Simmer for 2-3 minutes. Stir in the mustard and nutmeg, and season with salt and pepper. 4- Spoon one-third of the meat sauce into a large shallow ovenproof dish, cover with one-third of the white sauce, and one-third of the Cheddar and Parmesan cheeses. 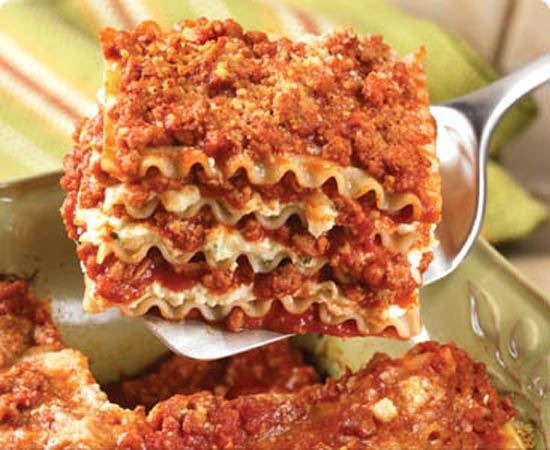 Arrange half of the lasagna in a single layer. Repeat the layers, finishing with the Cheddar and Parmesan cheeses. 5- Bake in a preheated oven at 190ْC (375ْF, Gas 5) for 45-60 minutes until the pasta is tender and the topping is a golden brown colour. Serve at once, sprinkled with parsley.